College math is a gateway course that has become a constraining gatekeeper for tens of thousands of students annually. Every year, over 500,000 students fail developmental mathematics, preventing them from achieving their college and career goals. 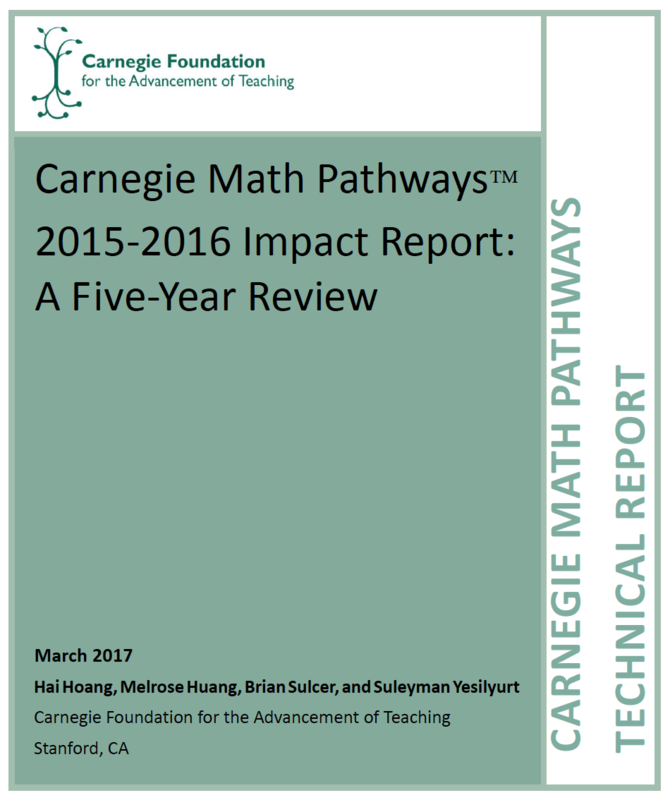 The Carnegie Math Pathways initiative offers students an alternative. It comprises two Pathways courses, Statway® and Quantway®, that provide post-secondary students with an accelerated method to complete developmental mathematics sequences and attain college-level math credit. Since its launch in classrooms at 29 colleges in 2011, Statway and Quantway have served over 20,000 students. In 2015-2016, the Pathways had achieved remarkable results even while serving over four times as many students as in its initial year. Student success rates in Statway, Quantway 1, and Quantway 2 reached 50%, 64%, and 67% respectively. New impact studies also show that Pathways students have higher completion rates, subsequent math enrollment and success, credit accumulation rates, and transfer rates from two-year to four-year colleges. This report provides descriptive statistics on the 2015-2016 student outcomes, as well as insights into potential areas for improvement based on data from the Pathways’ fifth year of implementation.